Facial palsy is a serious disorder with serious complications. Causes of Facial nerve paralysis are discussed in details and figures here. - Definition: Functional conduction nerve block. - Prognosis: Spontaneous complete recovery occurs within 1 - 4 weeks. - Definition: Degeneration of the nerve axon, but the nerve sheath remains intact. - Prognosis: The nerve axon grows inside the nerve sheath at a rate of 1 mm/day. Spontaneous recovery occurs, but is delayed (2-3 months) and maybe incomplete. - Definition: Degeneration of the nerve axon and nerve sheath. - Prognosis: worst. Spontaneous recovery is always incomplete and delayed up to one year. Depends on site of lesion. Inability to raise eye brow (occipito frontalis). Inability to close eyes firmly (orbicularis oculi). Inability to whistle (orbicularis oris). Food collects beneath cheek (buccinator). Deviation of angle of mouth to healthy side upon smiling, drooping of angle of month on affected side, dripping of saliva & loss of nasolabial fold (levator anguli oris). Affection of GSP: decreased lacrimation. Affection of nerve to stapedius: hyperacusis (disturbed hearing). Affection of chorda tympani: metallic taste. Tone: by comparing both sides at rest. Power: by comparing both sides during movement. Degree: partial or complete paralysis. N.B: In UMN facial paralysis only the lower half of the face is paralyzed, this is because the upper part of the motor facial nucleus supplying the upper part of the face is bilaterally represented in the cerebral cortex. CT scans of brain and petrous bone to show fractures, cholesteatoma, or tumors. MRI petrous bone to show tumors especially facial neuroma. lacrimal flow of both sides exceed 30% of the total bilateral lacrimation, indicating a lesion at or above the geniculate ganglion. a- Qualitative: compare taste of different staff applied to the lateral edge of the anterior 2/3 of the tongue. 4. Submandibular salivary flow test. Developed to evaluate the degree of facial nerve dysfunction, and the potential for recovery, they are used only in patients with complete paralysis. They are: minimum nerve excitability test (NET), maximal stimulation test (MST), electroneuronography (ENoG), and electromyography (EMG). Currently the 2 most helpful are: ENoG and EMG. Nerve excitability test: Determine the minimal electrical current in milliamperes required to produce a just visible muscle contraction, and compare both side, done 3 days after injury. This is the most important test. Measurement of the amplitude of the summation action potentials of the muscles when a supramaximal stimulus is applied to the nerve and compare both sides. This is important to detect the percentage of degeneration, which is important to decide the way of management and prognosis. It is done after 2-3 days. Fibrillation potentials indicates Wallerian degeneration. Polyphasic potentials indicate regeneration, and these are detected earlier than clinical recovery. Volitional activity: indicated that the nerve is in continuity. 1. Reassurance of the patient. Artificial tears during the day. Use of sun glasses outdoors. In prolonged cases, lateral tarsorraphy or gold weight implantation. a- Physiotherapy and gentle massage in a circular manner. b- Infrared heat and galvanic stimulation. c- When voluntary movement starts, the patient should start active exercises. a- Dynamic: to improve the function of the nerve during movement provided there is good status of muscles. - End to end anastmosis of the nerve. - Nerve graft: The cable graft is obtained from the great auricular nerve in the neck, or from the sural nerve in the leg behind the lateral meleolus. - Cross facial anastomosis: This is an anastomosis between the facial nerves of both sides, through a supralabial tunnel, using the sural nerve. - Hypoglosso – facial anastmosis. b- Static: to improve the appearance of the face at rest. - Implantation of fascia lata slings. - Regional muscle transplantation e.g. temporalis muscle in the cheek. 1- Contractures due to fibrosis of denervated muscles. A-Synkinesis. B-Crocodile tears: This is lacrimation while eating. 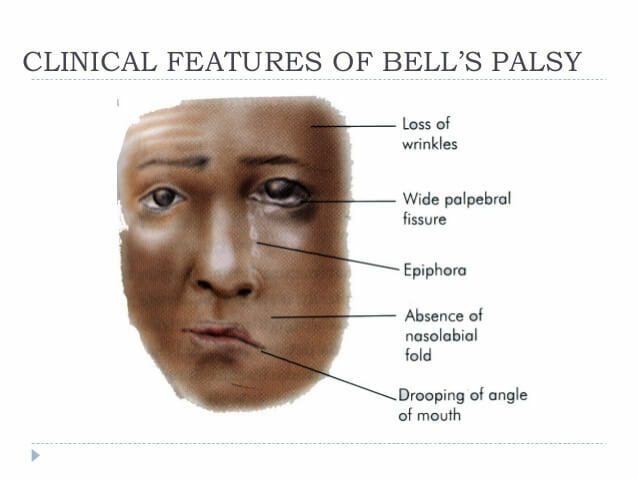 - Bell’s palsy. -Traumatic facial paralysis. - Herpes zoster oticus. -Active otitis media.